Stepping on the platform the other day I dropped my socks. This absolutely gorgeous Printemps poster! They're celebrating 150 years of doing business in a big way. More to come. 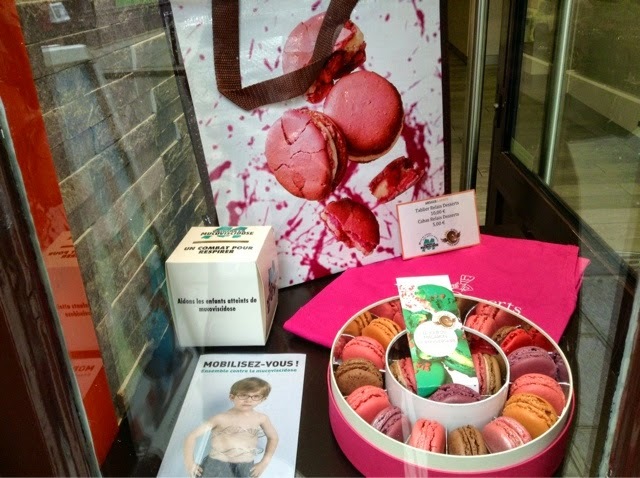 Jour Du Macaron is celebrating it's 10th anniversary - giving macarons away in exchange for a donation of 1 euro to the French charity, la Mucoviscidose (Cystic fibrosis). If you're in in Paris, do get out and participate in a worthy cause. Pastry chefs raised 50,000 euros last year. The event lasts through the weekend. 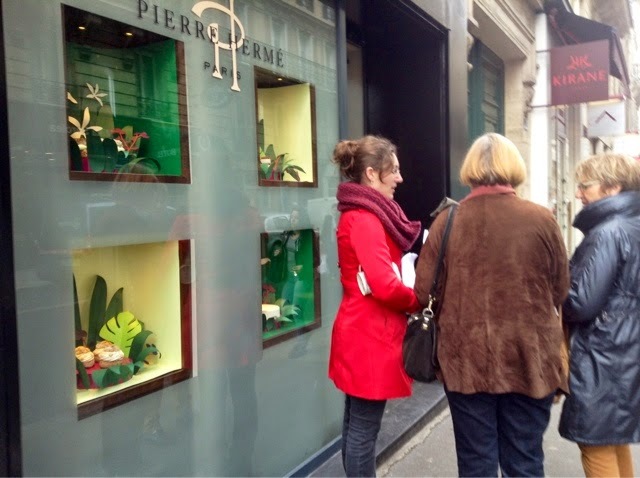 No better place to start than Pierre Herme, (on rue Bonaparte) who created the tradition. Not easy to choose one flavor from the 25 on offer. The colors are perfect for the 1st day of Spring. 'Celeste' won my heart - passion fruit, rhubarb and strawberry. Then on to nearby Arnaud Larher on 93, rue de Seine 75006. 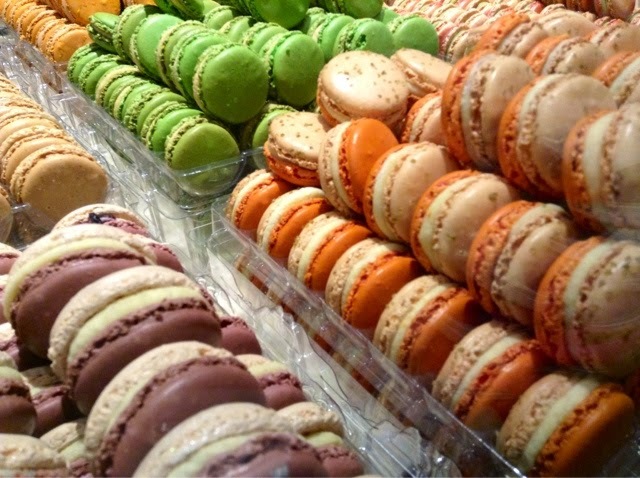 Here you can make more than one donation and walk out with possibly 5 macarons. I could not resist the pink broken macaron shopping bag(cabas) for 5 euros. The lovely apron(tablier) is 10 but I bought one last year. 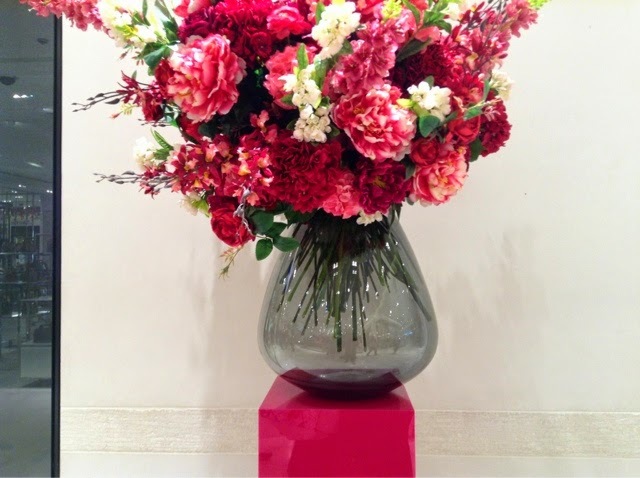 I only saw these at Arnaud Larher by the way if you're smitten too. 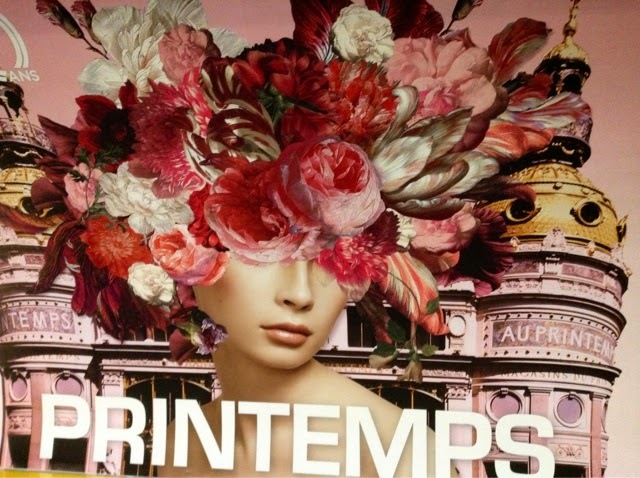 Then on to Printemps for a taste of Spring celebration. 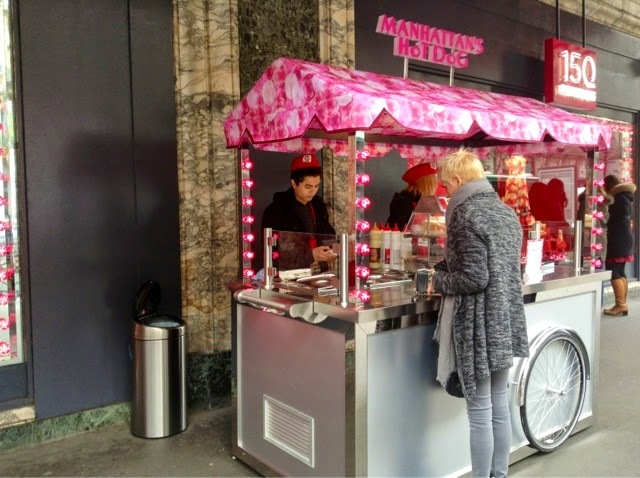 Loads of food carts line the façade selling Manhattan hotdogs, popcorn, waffles, little cakes and ice cream. A party in the street. 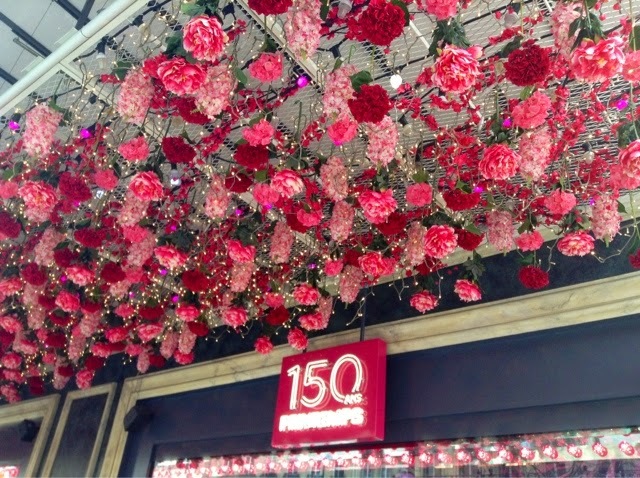 The windows show items especially designed for the 150th anniversary. 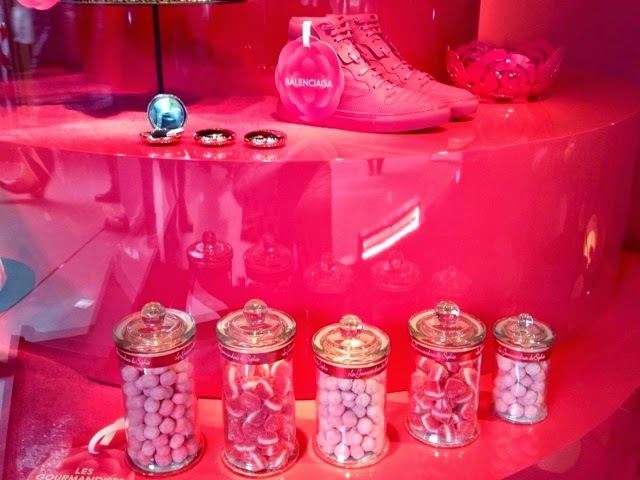 Those yummy hot pink Balenciaga sneakers have to cost a lot of macarons. One doesn't like to think. 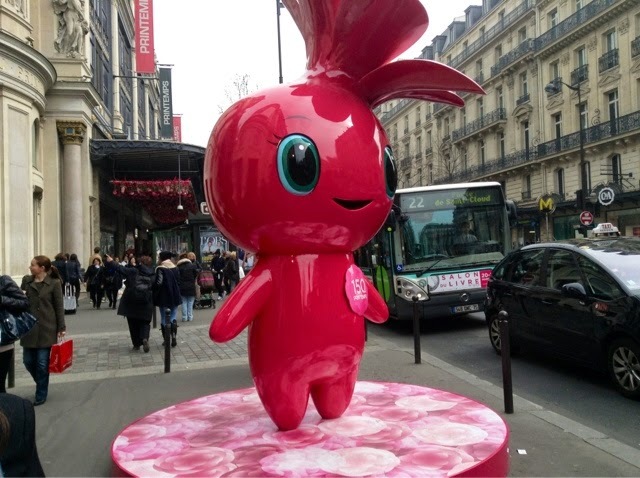 I don't know if this is a Murakami sculpture but if not it's a kissing cousin. Lots to raise the spirits inside Printemps as well. As always their signature Spring flower heads. Guys get ready to wear pink! 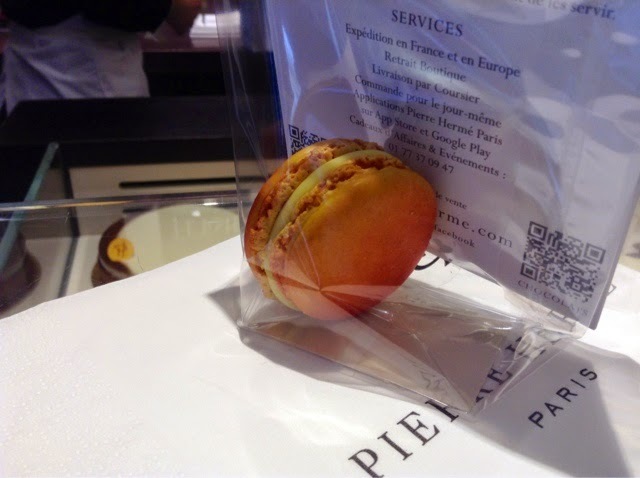 Galeries Lafayette next door has 3 Pierre Herme shops to add to your collection of macarons. There are 13 shops in all of Paris. 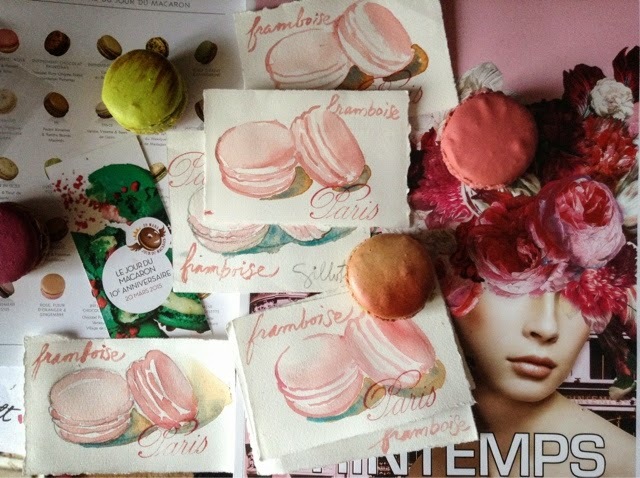 If you are not in Paris and would love to have your very own little (4 1/4" x 2 3/4") framboise macaron watercolor, do subscribe this weekend to Paris Sketch letters. I'll happily send one your way. Bonne Fete du Printemps PBers! Oh, so much glorious pink!! 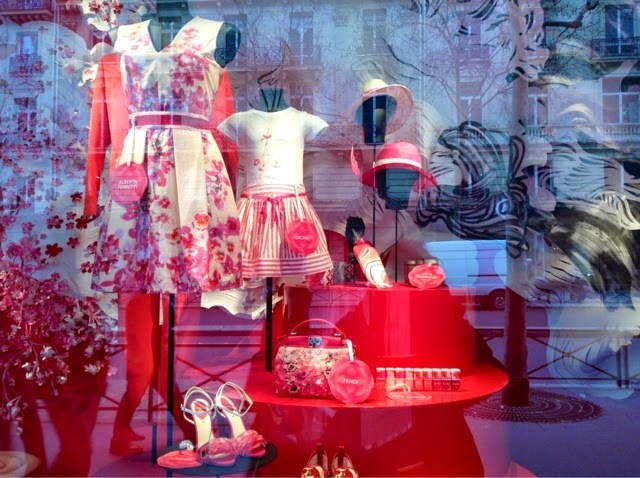 Spring has clearly arrived in Paris. And so many glorious macarons! Happy Jour du Macaron to you and Bear! I agree about that Printemps poster.Fantastic.That store looks amazing. I never knew that was the word for cystic fibrosis..Thanks for that too..I hope to remember..it's one of those words that you have to repeat several times to remember..like ostéodensitométrie(bone density test)..
That shiny little gremlin looks so much like the dolls Rosie O'Donnell paints..
Love the pink Paris stamp with your perfectly painted pink macarons. 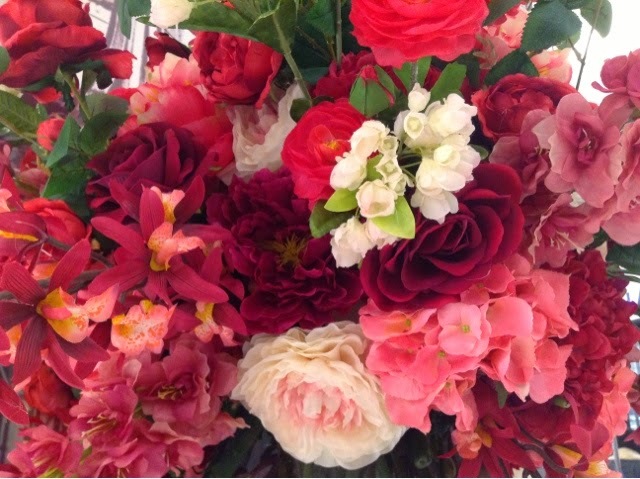 Those bouquets too..be still my flower hungry heart. Springtime, Printemps decorations looks fabulous. How could one not feel in the pink with so much of it everywhere. 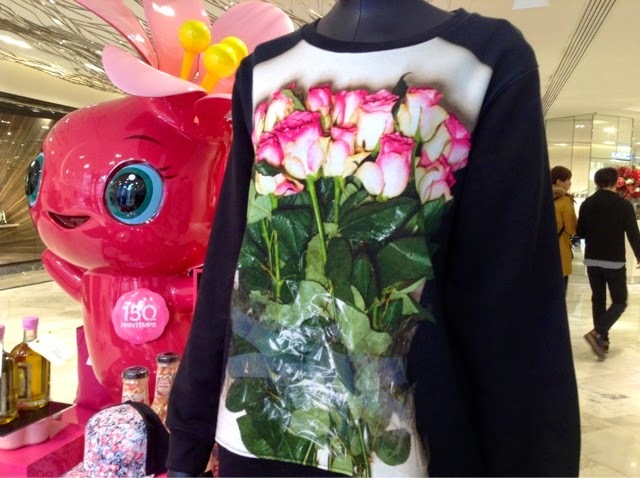 I hope you were wearing your Macaron T-shirt today ? Now that you have a macaron cabas, you will always have somewhere to put all your bits & pieces in one place. Wonderful floral decoration., maybe that's where Sharon of ' My Country Home ' gets her inspiration from. This is may be the 4th cabas of 2015.
Who needs a Vanessa Bruno bag? Carol, it's snowing this evening in New York as spring officially arrives. 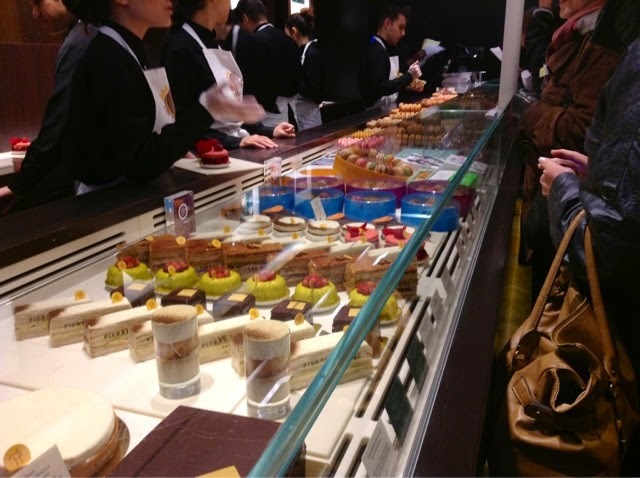 I think that I would much have preferred to skip around Paris sampling des macarons, while also helping a good cause. As you know, the euro is looking a bit more attractive just now. I must see what I can do about getting a long overdue view of ...the Paris that I love almost as much as you do,. 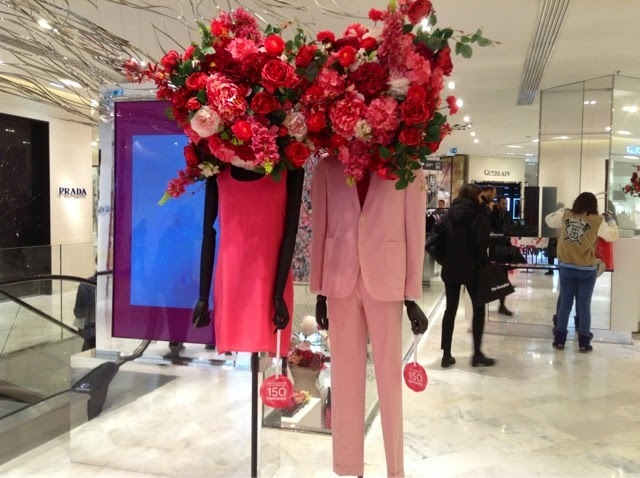 Printemps has really hit the spot with their floral arrangements...I'd trample over a dozen macs to get to one of those arrangements! 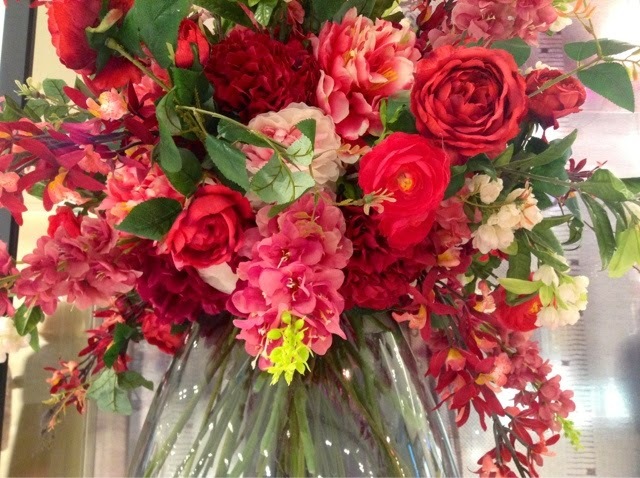 Those flowers are beyond gorgeous. LOVE LOVE LOVE your art and blog!!! I want to be you in my next life. magnifique ton post Macaron Carol !! are u sure u’ve seen macaron’s bag at Arnaud Lahrer’s ?? it’s a setting I’ve done for PH, the splash ?? To raise €€ for a good cause. I love my cabas! So very beautiful. Your letters make life here so fun. (even though life here is very wonderful) Your letters add to the joy. FANTASTIC FANTASTIC FANTASTIC. You are the BEST !!!!! That is a stunning poster! 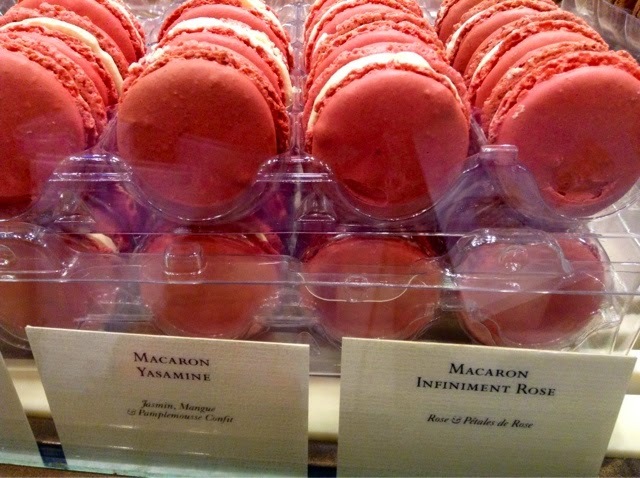 When you get to the macarons, you must have gone into the red zone, 'cause the pinks and reds just fill the frames & leap out at me! I love the poster ..it is wonderful...I would be so sick by now eating in every sweet shop...so beautiful, every shop...just so artistic...paradise..
People are always nicer to me when I where pink. Those bouquets are gorgeous. Thanks for doing the research for us. The flowers are breathtaking and the macarons look delicious. 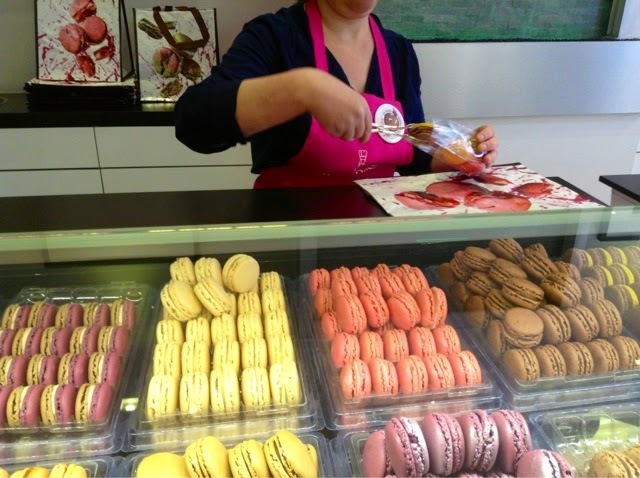 What a super weekend around macarons, Carol - and imagine bumping into you in rue de Seine? ... small world but when macarons are concerned, I guess it makes sense :-D What a lovely round-up you've done. My website is down for a facelift so lovely to read about it here on ParisBreakfasts! And apologies for the funny face in the window at Marcolini. Couldn't resist, although ended up embarrassing myself in front of a chocolate group, hehe. Biggest sigh! We are getting ready to jump into our annual macaron making day in a couple of weeks and seeing all these lovelies inspires me!